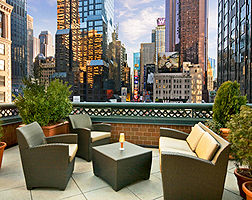 The Novotel Times Square, New York offers a number of ways to make your stay extra special – if you know about them! The Novotel Times Square is even pet-friendly – so if you can’t bear to leave your canine friend at home, sort out a doggy passport and book him into the hotel with you! The Novotel Times Square is very family friendly, and can organise children’s beds, a kid’s welcome gift and even babysitting if necessary. The hotel also offers a number of wheelchair accessible rooms for disabled travellers.